It is a beautiful afternoon in West Cornwall – sufficiently warm and dry to give the lawn its first cut, ably “assisted” by my jack russell, Spud, whose greatest joy in life is to dive bomb the lawn mower, kamikaze style. Tomorrow, by contrast, I am told we face sub zero temperatures but March is upon us, so…. soon it will be Easter. To get you in the mood, this month’s offer is a free Little Egg when you place an order with us on line, regardless of its value. 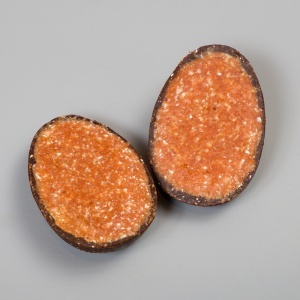 The Little Egg is like a healthy cream egg – raw vegan vanilla fudge on the inside with a raw chocolate shell. We sold thousands last Easter, it proved so popular, with children as well as adults. As with our Raw Chocolate Pie, Little Egg is dairy, gluten and soya free with no added refined sugar. It is also delicious! 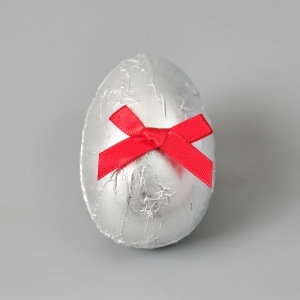 Have a look at all our Easter eggs on the website. We can send them for you direct to family and friends and you can include message which we will write out on a gift card.